They say, “location is everything” in real estate. When land development teams are siting new restaurants, banks and other retail locations, they often look for the most accessible lot with a high volume of vehicle traffic. Sometimes, that corner lot they desire is vacant and screaming for an HGTV-style extreme makeover. Those are the kind of properties that capture my attention too, but for an entirely different reason. While the engineers are calculating how many parking spaces they can cram into their design, I’m looking at the suspicious antique light pole that looks a lot like the ones they used to erect at 1960s-era gas stations. My job is in environmental consulting; specifically, my firm assesses properties to determine whether they are, or could be, contaminated with hazardous materials that could result in a risk to human health and the environment. My time is primarily spent assisting clients with following the highly complex environmental regulations in Massachusetts (some of the most stringent in the country). I also perform ASTM Phase I Environmental Site Assessments (ESAs), which are a standardized method of identifying environmental concerns through research of a property’s history, records reviews and a site visit. Commercial real estate agents and loan officers are familiar with these reports, as they are often used to determine whether a property’s value may be impaired by hazardous materials issues. If there are concerns identified during the Phase I ESA, we then discuss with the client the option of invasive testing to better quantify the risks. This may include the collection of soil and groundwater samples, and use of ground-penetrating radar to look for subsurface tanks. Occasionally contamination on a property is so severe that it’s a “deal killer.” The potential costs of remediation may devalue a prospective site so much that a developer decides to walk away. Sometimes I feel more like a historian than a scientist. Back in the office, I delve into records – plans, maps, permits – some that date to the late 1800s, looking for any indication of environmental problems. The top offenders are drycleaners, gas stations, and automotive repair shops. Drycleaner operators for instance, have always favored the use of powerful solvents. In the early 1900s, the solvents were petroleum-based, and by the mid-1900s, a type of chlorinated solvent known as perchloroethylene (PCE or “perc”) became popular (and is still in use today). Perc can cause respiratory distress and skin irritation in humans, but it’s also a probable carcinogen. Interestingly, chlorinated solvents actually sink in water, are highly mobile and persistent, so once groundwater is contaminated (which happens quite often on drycleaner sites) the solvents can travel hundreds of feet (sometimes over a mile given the right geological setting). Once in the groundwater, the solvents can volatilize into indoor air in buildings potentially impact human health. Chlorinated solvents used in other industries are what caused the contamination to Woburn’s drinking water supply as publicized in the book and movie A Civil Action. 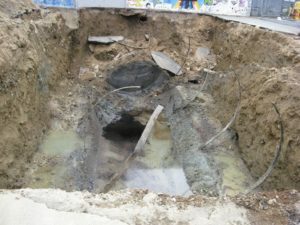 View of groundwater within the tank excavation. Floating oil (black film) can be seen on the groundwater surface. Former gas stations are another environmental concern due to the large underground petroleum storage tanks used to hold gasoline and diesel. When gas stations were becoming popular, fuel was stored in single-walled steel underground tanks that are susceptible to rust and corrosion. These bare steel tanks, susceptible to leakage, were common up until the 1980s. They became such a problem that in Massachusetts, it was mandated that all single-walled steel tanks be removed or permanently closed in place by August 7, 2017. That requirement worked for tanks that are documented or permitted. However, abandoned underground storage tanks (I call them “mystery tanks”) that have been left buried at properties, pose a hidden risk during property redevelopment. Contractors may come across these tanks when excavating for new construction. We’ve even discovered mystery tanks in gas station redevelopment projects – what turns into a single tank removal can suddenly unearth a separate generation of forgotten tanks from the 1960s. Petroleum, as many of us know, floats on water. 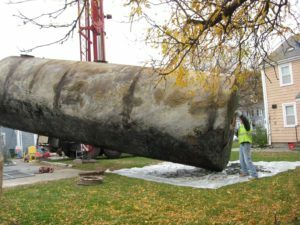 When the contractor pulls a leaking tank out of the ground, you can see it in the droplets or layer of gasoline that forms on the surface of the water table in the excavation. There’s also the potent odor of weathered gasoline that can really stink up the block. Corroded steel tank removed from the ground at a housing development. Other historical environmental concerns are less obvious – the City of Boston consists of a significant amount of now-filled former wetlands and water bodies. The fill is usually dark brown or black with coal slag and fragments of bricks and other building materials. In certain parts of the City, the urban fill contains high levels of heavy metals and other contaminants. In Massachusetts, the regulators recognize that is it infeasible to remediate the urban fill in an entire City. However, the costs of disposing contaminated urban fill generated during new construction can be two to ten times more than that of clean soils. Even though we may discover that a client’s ideal spot for that new pharmacy holds a high amount of environmental risk, these risks can be managed appropriately. The developers who choose to properly assess and remediate the contaminated properties (face the “deal killers” head on) perform a real service to the community. Many of the contaminated sites reported to the state are remediated to the point at which they can be suitable for unrestricted residential uses, meaning that there are no hindrances to future residential development on the property and no significant risk posed to human health. Not to mention, turning a haunted-looking vacant building into a shiny new coffee shop is likely to boost nearby property values. Although there are still many contaminated properties lurking on busy street corners, the good news is that over 1,500 sites are cleaned up under the Massachusetts regulations every year. In addition, the number of contaminated sites reported each year is decreasing due to improvements in underground storage tank technology and better hazardous materials handling practices and regulations. My best advice to those who buy commercial property for development is to enlist a professional to perform your environmental due diligence — the earlier into your project planning stages the better. The point is — environmental issues (and the associated financial impacts) are easier to plan for and manage when they have been identified before a contractor starts digging the foundation. The current business practices and state of a property do not always reflect what lies beneath the ground’s surface in the soil and groundwater. Katherine Kudzma graduated from Boston College with a B.S. in Environmental Geosciences in 2008 and later earned a Master's Degree in Environmental Management and Sustainability from Harvard University. She currently works as a Senior Environmental Analyst for VHB, a mid-size civil engineering and land development firm with offices throughout the east coast. Ms. Kudzma previously gained experience working at a financial institution where she reviewed environmental studies conducted to facilitate commercial real estate transactions. She is a member of the Association for Women Geoscientists New England Chapter and the Licensed Site Professionals Association.